If you're remodeling your house or building a new home and are currently considering which type of roof to use you've surely found you're not short on options. And while there are many different choices, this article encourages you to not overlook tile roofing. Tile roofing offers some amazing benefits compared to other types of roofing, and not just because it looks so great! If you're searching for the perfect way to top off your home don't forget these wonderful benefits of tile roofing. Tile roofing provides a timeless look for any structure. Tile roofing is available in many different colors and styles, including ones that replicate wood and composite shingles. The variety of colors that tile comes in is incredible, which mean you are sure to find just the right looking roof for your home. Tile roofing can help save you money on your HVAC bill because it's unique composition allows it to help hold air better. This means that it will keep homes cooler in the hot months and warmer when it's chilly. Tile roofing sits on a roof in a way that makes it difficult for wind and rain to get under the tiles and lift them off the roof, opposed to some other types of roofing. This means they are more structurally sound and damage resistant. Should a tile crack they are easy and affordable to replace. Most types of roofing tiles carry a Class-A rating in safety because they are made out of materials that won't burn, such as clay. This helps to prevent fires from spreading, should one break out in your home. Tile roofing can last for decades, even as long as a century or more with proper care. Because tile roofing adds so much to a home in terms of safety, great looks and longevity, the roof actually can increase property value and make it easier to sell your home in the future, should you decide to do so. If you're looking to install tile roofing in McKinney, Texas or the surrounding towns, including Allen, Fairview, Melissa and Prosper, be sure to talk to the team at Trifecta Roofing and Construction. 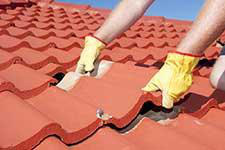 We offer a huge variety of roofing options, including tile, composite and metal. We'd be happy to provide a free roofing consultation and quote to help you identify the best roof for your home. Give Trifecta a call at (469) 620-7672 to request an estimate from a professional roofer in McKinney.